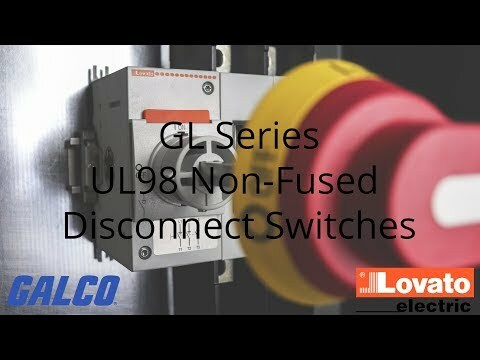 Lovato&apos;s GL Series UL98 non-fused disconnect switches are available for 200 amps in a compact, 162mm / 6.4-inch-wide package that can be easily mounted directly onto 35mm DIN rail. It is designed to resist sliding on the DIN rail thanks to rubber pad inserts built into the component. They can also be installed using screw fixing in all directions thanks to their adjustable clips that can be rotated and repositioned. Thanks to windows on each individual power pole, the open or closed status on each switch is quickly visible at a distance providing a higher level of safety for the user. The GL series comes standard as a 3-pole switch, but a 4th pole can be added in the form of an add-on accessory. The phase barriers are integrated as standard to comply with UL98. The GL series switches are further expandable for additional application flexibility, supporting additional add-ons including neutral and earth/ground terminals which only require 2 screws to install. Other common accessories include a variety of auxiliary contacts, terminal lugs, terminal covers, extension shafts, shaft guide, direct and door coupling handles to satisfy every installation requirement. Direct operating handles are available in either black or red/yellow and are padlockable. Pistol type handles are available in either black or red/yellow, rated IP66 and NEMA 4X, padlockable and defeatable to comply with UL508A. Extension shafts can be mounted and removed very easily by simply snapping on the front of the switch allowing fast installation and easy accessibility to the panel for maintenance purposes.